Simply exquisite in any decor! Pure Beeswax Rose Taper Candles in your choice of natural or hand-dyed colors, unadorned (plain). Handmade to order in my "Garden" style, resembling a rose in bloom. No two candles look exactly the same. 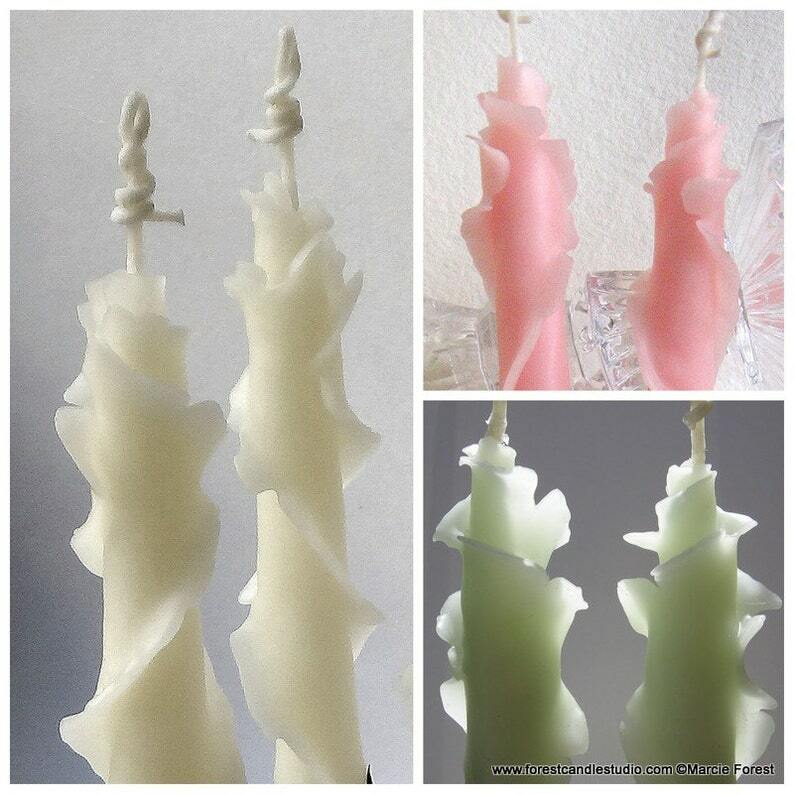 This listing is for one pair of tapers ( a set of two candles) in your choice of 6", 8" or 10". If you need additional pairs add them to your cart if that quantity shows as available. Postage fee adjusts automatically for the additional weight (if ship fee turns out to be less to your location I'll refund overage paid). If you need more tapers than available, contact me to add them to your order. Contact me for larger quantities, different colors, adornments. Matching Rose Pillars are also available. "Marcie Forest is phenomenal! Her taper candles are truly pieces of art. I received so many compliments on the glitter rose taper candles. They also burn beautifully. Marcie was a joy to work with and completely accommodating in every way. From the exquisite packaging to the simply gorgeous candles, I highly recommend Marcie Forest!" Photos show examples of unadorned (plain) rose tapers from previous orders - yours will be handmade to order in the color & size of your choice. Also available adorned with rose petals or glitter in my shop or by request. This listing is for one pair of tapers ( a set of two candles) in 6", 8" or 10". If you need an additional one or two pairs (in any height or color) add them to your cart if that quantity shows as available. Postage fee adjusts automatically for the additional weight (if ship fee turns out to be less to your location I'll refund overage paid). If you need more tapers than available, contact me to add them to your order. Handcrafted at my art studio in California. Since each candle is individually hand-built by shaping and dipping the delicate layers, the sizes are approximate and will vary slightly. Holders aren't included. Contact me if you need help finding holders. The current estimated production time for this item is listed in the "Shipping & Policies" tab. If you need to receive the candles sooner or by a specific date, tell me during checkout in the "notes to seller" section. Rush orders accommodated when possible (there may be an additional charge). In my signature packaging: kozo hemp lace paper, tied with tulle ribbon. A Forest Candle Studio mini note card is enclosed (candle info & burning instructions are on the back). See the "Shipping" section to see PAYMENT & SHIPPING INFO for this item, and my general SHOP POLICIES. My "standard" method of shipping is via US Post Office Priority Mail with tracking & insurance. Usually 3 days delivery time but can take up to 5 days. Overnight delivery via Express Mail is an available option during checkout for an additional charge. Rates shown are California to East Coast. For a quote to your location contact me. Otherwise, I will refund shipping fee overages to you via your original payment method. These candles are very pretty and the seller is very pleasant to deal with. These candles are exquisite art pieces, down to the tasteful wrapping they come in.